Congratulations to the pupils from Rang a 1 who were national finalists in the Safety Sheriff Poster Competition they entered this year. Schools from all over the country took part in this competition and they were one of 5 schools chosen to be in the final. 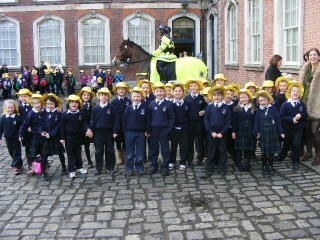 On Tuesday the 2nd of February they were brought to Dublin Castle by bus for the award ceremony and from there on to the zoo. The overall winners received €2,000 for the class and the 4 regional winners were presented with a great prize of €500 prize – to be spent on a school tour for the class. Every child drew a picture in class for the competition and the class decided the best one to enter into the competition. Well done Rang a 1! 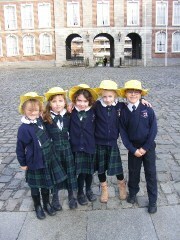 Here are the children who had an input in the winning poster.